This multi-colored bracelet is perfect for adding unique dimension to a neutral outfit. 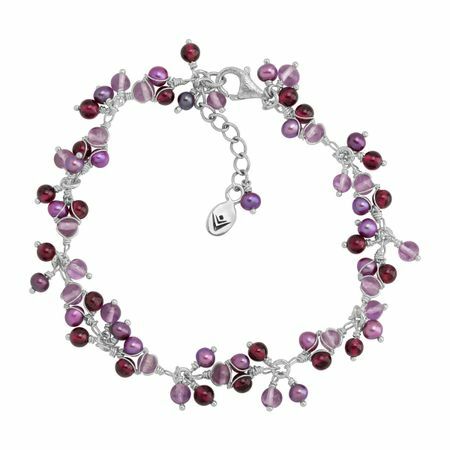 Amethysts, garnets, and freshwater pearls suspend from a quality sterling silver chain for free-moving flow. This piece is part of our Balinese Collection, inspired by the beauty of Southeast Asia and handmade in Bali using ancient silversmith techniques. Bracelet measures 8 inches long, plus a 1-inch extender for adjustable length, and features a lobster clasp. Piece comes with a “.925” sterling silver stamp as a symbol of guaranteed product quality.